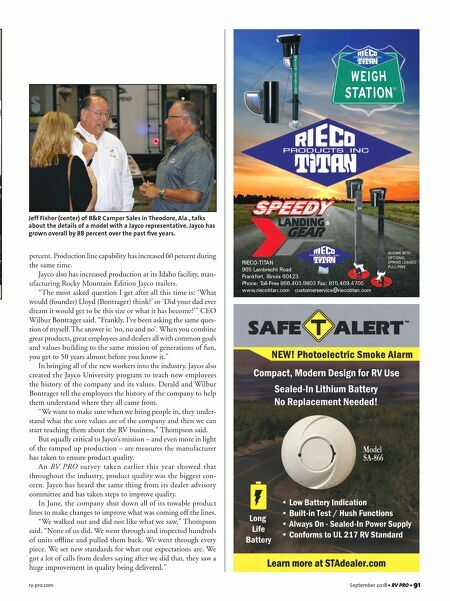 90 • RV PRO • September 2018 rv-pro.com R V M A N U F A C T U R E R S Still, there were plenty of models with more traditional fea- tures and items that appeal to the more discerning customer who wants a true home away from home. Seismic toy haulers featuring a dazzling new walk-in shower with a sliding glass door and North Point fifth wheels with full Furrion Master Chef kitchens and 21.2-cubic-foot residential-style refrigerators were only a few of the models appealing to the more traditional RVer. 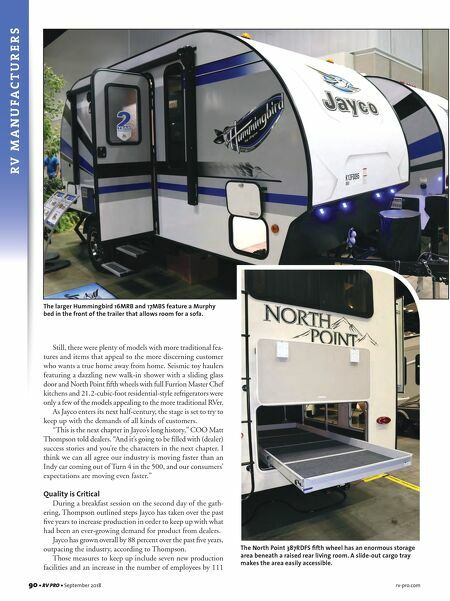 As Jayco enters its next half-century, the stage is set to try to keep up with the demands of all kinds of customers. "This is the next chapter in Jayco's long history," COO Matt Thompson told dealers. "And it's going to be filled with (dealer) success stories and you're the characters in the next chapter. I think we can all agree our industry is moving faster than an Indy car coming out of Turn 4 in the 500, and our consumers' expectations are moving even faster." Quality is Critical During a breakfast session on the second day of the gath- ering, Thompson outlined steps Jayco has taken over the past five years to increase production in order to keep up with what had been an ever-growing demand for product from dealers. Jayco has grown overall by 88 percent over the past five years, outpacing the industry, according to Thompson. Those measures to keep up include seven new production facilities and an increase in the number of employees by 111 The larger Hummingbird 16MRB and 17MBS feature a Murphy bed in the front of the trailer that allows room for a sofa. The North Point 387RDFS fifth wheel has an enormous storage area beneath a raised rear living room. A slide-out cargo tray makes the area easily accessible.